All male and female athletes from 18 years old on and in possession of a certificate for sport ability can enter the competition. The registration has to be made, filling in the online entry form and it will be complete only when a copy of the payment will be send via fax +39-0462-352091, or e-mail to rampa@fiemme2013.com, by and no later than 12 a.m. of Thursday, 6th January 2011. 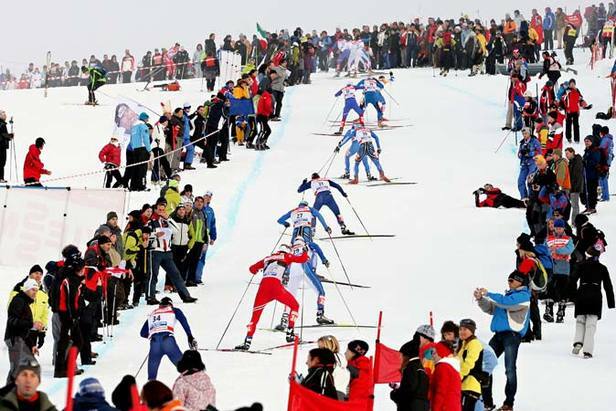 The confirmation of the entry can be verified on the official website www.fiemme2013.com. The Organizing Committee could anticipate the closing date for entries when reaching the final number of 200 competitors. The race is in free technique. The bibs will be assigned according to date when the entry was sent. The team captains' meeting will take place on Saturday, 8th January 2011 at 6.30 p.m., at the cross country stadium in Lago di Tesero. The Organizing Committee will provide the transportation of the clothing from the cross country stadium in Lago di Tesero to Alpe Cermis. For circumstances beyond one's control, the OC has the faculty to change, without limitations, the course of the race or to cancel the whole competition. In the latter case, the entry fee will be completely reimbursed. Every competitor has to be conscious that this race requires a considerable physical and technical engagement. Sending the entry form, each athlete declares implicitly, with his/her own responsibility, to possess such requirements. There will be two time limits along the course: the first one will be at the base of the climb of Cermis (10.30 a.m.) and the second one will be near the road to Salanzada (11 a.m.) Time limit to reach the finish: 2 hours. By sending the entry form, each competitor declares to know and fully accept these rules, exempting the organizers from every responsibility, both civil and criminal, for damages to people and/or things, caused by him or suffered by him. Claims can be delivered to the Jury within 15 minutes after the exhibition of the unofficial result list, with a deposit of € 50, which will be returned in the event that the claim is accepted.